I don't know about you, but our calendars are already booked up with a least a half dozen holiday parties. I absolutely love everything about holiday parties - decorations, eggnog, Christmas music, and of course, lots of cheer. However, it's always a challenge deciding what to wear. Holiday parties can be very daunting and stressful, especially if you're having an office party or attending a company party with your significant other. Dressing appropriately, not to mention acting appropriately, are of the utmost importance. Throughout the month, I am going to be showcasing outfits that I think are great to wear during the holidays, and what parties you should and shouldn't wear them to. Dressing for the holidays doesn't mean you need to be covered in green and red. Instead, I like to incorporate a pop of something festive, which includes sequins, glitter (like my shoes! ), fur, even an ugly sweater or two. These things remind me not only of the holidays, but of the winter season. 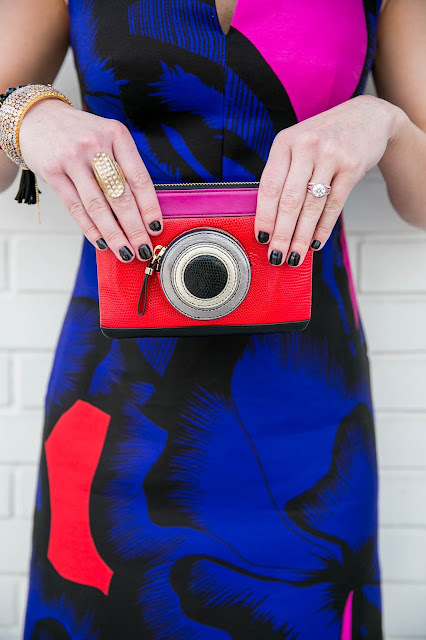 This Diane von Furstenberg dress, which is on sale for 60% off, is the perfect dress to wear to any party you may attend this holiday season. 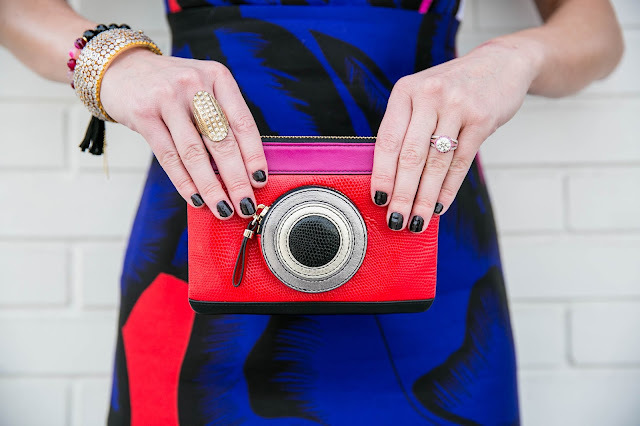 Depending on how conservative your work environment is (or the work environment of your significant other), I would suggest switching out the fun, camera clutch, for something a little more subdued like a solid color clutch. Also, you could add a cardigan and black opaque tights. If you're attending a shindig with friends, I'd up the ante by wearing a black faux fur coat with this! Nothing dresses up an outfit better than high heels, but of course sometimes the shoes we love leave our feet begging for mercy. Solemates has all you need for your shoe needs. Their Blister Blocker is a lifesaver if you're breaking in new shoes or wearing some of you old favorites that cause you pain. It glides on clear and prevents blisters by minimizing friction on the skin. I carry it with me at all times - it's a definite must have. Also in their arsenal is a genius product called the "High Heeler." The High Heeler is a cap that you put on your heels so that they don't sink into grass, but they also protect the shoes from damage from wooden decks, grates and cobblestones. But the best part is, they protect your wood floors from the damage that heels can cause. If you're anything like me, you hate having people wear shoes in the house, but when you're having a party, you have to make an exception. This would be a great gift to give your guests upon arrival. Trust me, they'll be using them all the time. Solemates has so many great products, so be sure to check out their website. This look is amazing. I love the colors! 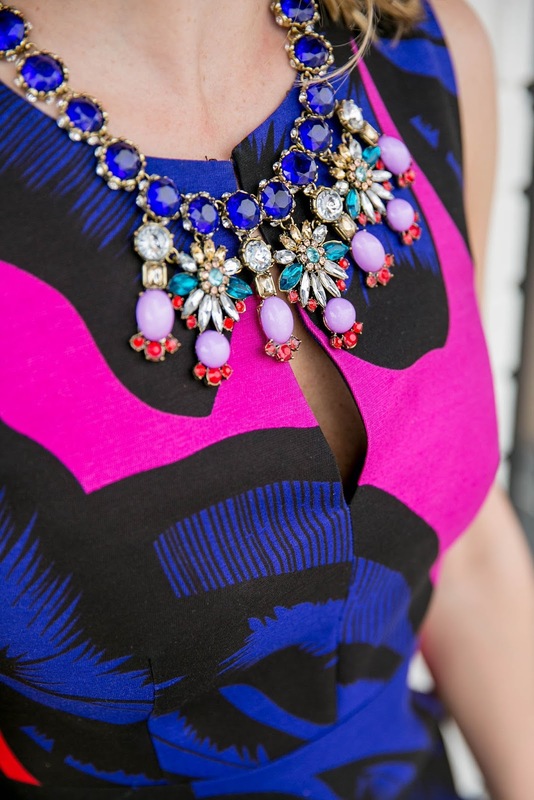 It's great how you accessorized it with bold pieces, too.